The term Danish entry is commonly used to describe entryways to livestock buildings that help people enter barns in a relatively bio secure way without having to shower-in shower-out. 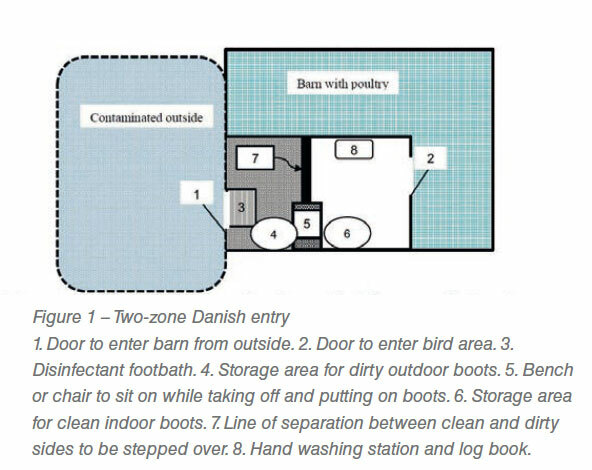 Danish entries are designed to make it easier for people to remove potentially contaminated outside clothing and boots and put on barn specific clothing and boots to prevent infection transfer as they cross a line of separation from outside to inside a bio secure poultry barn. 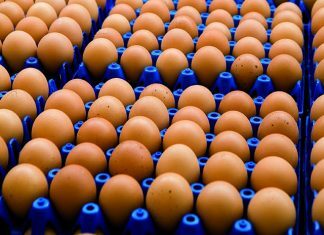 A goal of biosecurity is to prevent of the introduction of disease organisms into animals on a farm and control of the diseases’ spread within and between barns and farms if there is an outbreak. 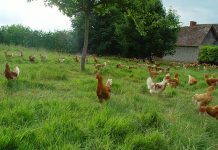 Flow analysis on animal farms is a systematic way to plan, layout and design farmsteads and animal facilities to enhance the movement of people, animals, feed, supplies, materials, equipment and ventilating air into, through and out of the farm and barns. Five steps of flow analysis (Table 1) can be used to assess and maintain the biosecurity level desired and efficiently and safely facilitate the operation’s management and operational plans. System boundaries define both farmsteads and individual barns. Roads, property lines, gates and fences around a farmstead can be used to define a farmstead boundary. Barn boundaries define lines of separation between clean and dirty areas. In many cases the barn boundaries define lines of separation between inside and outside the barn. Several barns connected by enclosed hallways can be used to define the boundary between the inside and outside of a complex of interconnected barns. Flows can describe the movement of everything that crosses a farmstead or barn boundary. It is important to develop a comprehensive list of people and things they carry that cross the boundaries. The people list includes owners, managers, animal care employees, other employees, consultants and visitors. Things include tools, supplies and personal items. 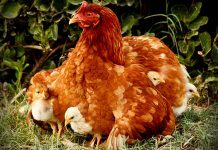 Many other things besides people and the things they carry cross farmstead and barn boundaries including trucks, live animals, mortalities, feed, water, air, equipment, supplies, bedding and manure. The last two flow analysis steps are to assess biosecurity risk associated with each flow and item that must enter or leave the barn or farmstead and to develop protocols to manage the risk. Supplies and tools needed by people to do their job need to be cleaned and disinfected whenever they cross a boundary to maintain farm and barn biosecurity. The term Danish entry is commonly used to describe entryways to livestock buildings that help people enter barns in a relatively bio secure way without having to shower-in shower-out. 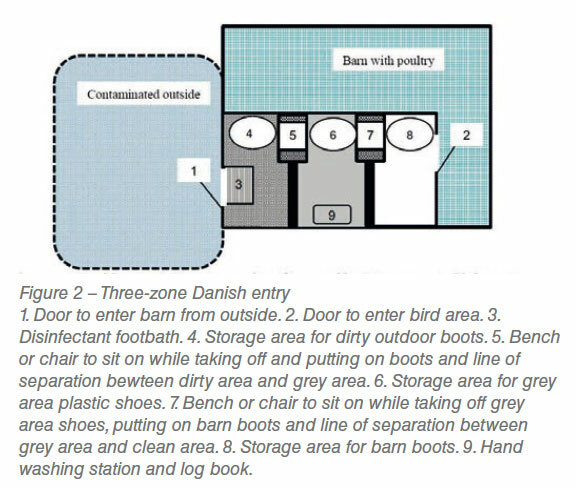 Danish entries are designed to make it easier for people to remove potentially contaminated outside clothing and boots and put on barn specific clothing and boots to prevent infection transfer as they cross a line of separation from outside to inside a bio secure poultry barn. The line of separation between a potentially infected space and a non-infected bird occupied space is a key concept of a Danish entry. There are multiple ways to create a line of separation to reduce potential infection transfer using either two-zone or three-zone approaches. Two-zone Danish entry – With a two-zone Danish entry there is a dirty area and a clean area and they abut each other with a single line of separation between them. Two-zone Danish entries are common when space is limited. One concern about two-zone Danish entries is that the clean and dirty areas abut and there is potential for contaminated materials to inadvertently crossover the line of separation from the dirty side to the bio secure clean side. With a two-zone Danish entry the person enters the barn and steps into a disinfectant pan or boot tray. Then the person sits on a bench or chair keeping their outdoor dirty boots on the dirty side of the line of separation. They remove their outdoor boots and place them on the dirty side boot storage area, wash their hands with hand sanitizer and without letting their stocking feet touch the floor they swing their feet over the line of separation and put on a pair of boots from the clean side boot storage area. Then the person washes their hands at the hand washing station and signs the log book before entering the bird area through the door. For the Danish entry to be successful no one can ever cross the line of separation without changing boots. Three-zone Danish entry – With a three-zone Danish entry there is a dirty area and a clean area separated by a grey zone. The grey area has more space for changing boots and coveralls and washing hands than a two-zone Danish entry. Three-zone Danish entries generally require more space, heat in cold weather and floors with drains. There are several options that can be implemented at the exterior door and the grey area. Some farms have people entering the building from the outside put on plastic disposable boots over the person’s outdoor shoes as they step into the barn, never letting the disposable boots touch the ground outside. Other farms use disinfectant pans or boot trays as done with the two-zone Danish entry. With a three-zone Danish entry the person enters the barn and steps into a disinfectant pan or boot tray. Then, the person sits on a bench or chair keeping their outdoor dirty boots on the dirty side of the line of separation. They remove their outdoor boots and place them on the dirty side boot storage area, and without letting their stocking feet touch the floor swing their feet over the line of separation to the grey area, where they put on a pair of plastic shoes from the grey shoe storage area. Then one washes his hands at the washing station and signs the logbook and sit on the grey area bench or chair keeping their grey area shoes in the grey area. They remove their grey area shoes and place them on the grey area storage area and without letting their stocking feet touch the floor, swing their feet over the line of separation with the clean area, where they put on a pair of barn boots from the barn boot storage area. The person can now enter the bird area through the door. Barn managers are encouraged to provide either benches or chairs when people need to put on or take off boots and coveralls to avoid slips and falls. In addition managers may want to consider what order they expect people to put on coveralls and boots, whether to provide plastic slip on shoes for use in the grey area of a three-zone entry, what type of hand washing station to use, whether to use disposable or washable towels, coveralls and boots. 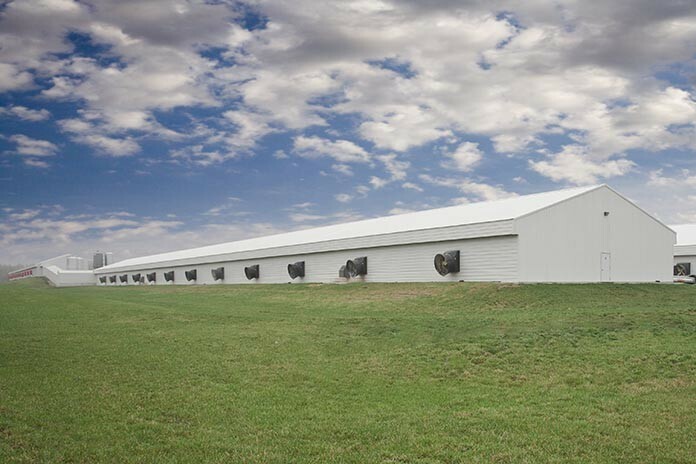 These options allow barn owners and managers to develop biosecurity protocols that fit their management plan while considering disease transmission risks across the line of separation and costs of facilities, employee time and supplies. People need to thoroughly wash hands after taking off potentially contaminated boots and coveralls and before touching barn specific boots or coveralls. A poster with clear hand washing instructions posted at each hand washing station will help remind people about the standard operating procedure to be followed. It is also critical that barn specific boots and coveralls be provided at all times to every person entering the barn. Some operations designate farm specific washable coveralls be used by people working outside the barns and barn specific coveralls used by employees that work inside the barns. Consider using tape around the top or purchasing different type of boots to clearly designate farm specific boots and barn specific boots. Farm or barn specific boots should never leave the farm. Farm or barn specific boots should be power-washed to remove dirt and feces from the soles and disinfected routinely. In some Danish entries barn specific boots are stored in a tub with a disinfectant when not being worn. Power-washing after use to remove manure will help keep the disinfectant clean and effective. Routinely replace the disinfectant solution to maintain its effectiveness. Provide clear protocols for disposing of used disinfectant and preparing fresh disinfectant. Some Danish entry systems separate the zones with concrete curbs and provide floor drains for each separate zone. The curbs help reinforce the line of separation concept and make it easier to wash down the floors in each zone without contaminated material crossing the line of separation between the three zones. Separate cleaning tools should be used in each zone to avoid contamination across lines of separation between bio secure and contaminated areas. Signs in appropriate languages are an important tool for communicating and reminding employees and visitors about the protocols everyone is expected to follow when entering and leaving either the farmstead or barns. Signs outside the barn doors need to clearly describe the steps a person entering the barn needs to follow as they enter. Interior signs can describe additional practices to be followed by employees and visitors as they enter the different areas of the Danish entry. Danish entry ventilation needs depend on whether the animal area has filtered ventilation air or not and the pressure difference between the Danish entry and the animal area. Air flows from high-pressure areas to low-pressure areas. 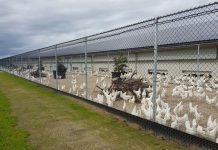 If airborne disease transmission is possible and the animal area is ventilated using filtered air and exhaust fans, the animal area will be at a negative pressure relative to outside. To be effective the barn must be extremely tight with very little infiltration through cracks in walls, around doors and the ceiling. If the Danish entry is at or below the pressure in the animal barn, there is little chance of outside air entering the barn through the Danish entry. If the Danish entry has a pressure higher than the animal area there is a chance outside air could enter through the Danish entry and it would be important to provide filtered air to the Danish entry.